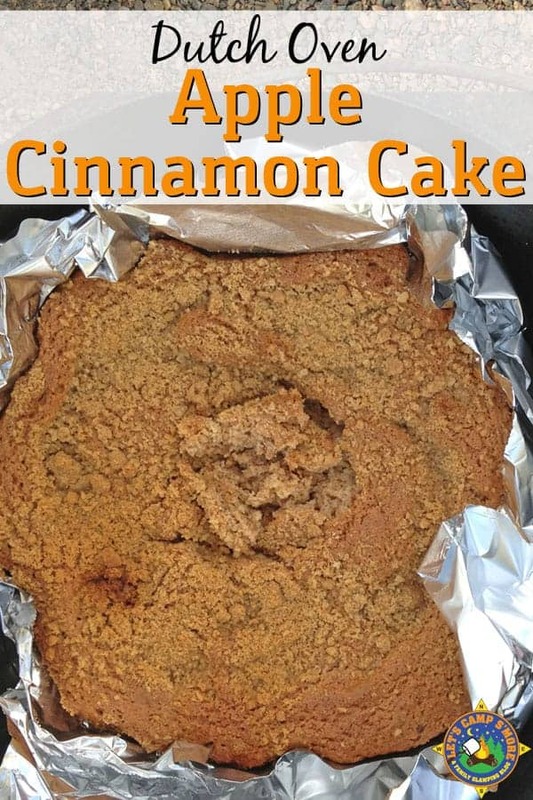 Here is an easy apple cinnamon cake recipe made in the dutch oven with a muffin mix and apple sauce. While it makes a great dessert, it would be perfect for breakfast too! Back in June 2013, we had a big 18 day camping trip to Colorado. We had a great time exploring the state and we made lots of great desserts in the dutch oven. One of our favorites was this Apple Cinnamon Cake recipe. This is super easy to make with a muffin or cake mix. I picked up an Apple Cinnamon Muffin Mix at Aldi. We mixed the ingredients in a plastic bowl before placing into the dutch oven, but you could mix the cake right in the foil too. This is what the mixed cake batter looked like. Our cake mix came with some crumb topping, which I sprinkled on top. The cake is baked for 20-28 minutes depending on your heat. We usually use our noses to know when to test for doneness. We could really smell a strong baking smell and when we pulled it out at 25 minutes it was burned along the bottom! Too much heat on the bottom. We still devoured it. It was moist and yummy. The dutch oven we used has a 10 stamped on it. Last summer we used a 12 and really had issues with getting things to cook. We have joined custody of these dutch ovens with some friends of ours, but I would recommend a 10 for anyone who wants to buy one. Dutch oven recipes can also be done in the regular oven! Have you ever used a dutch oven? What is your favorite recipe? In a separate bowl, mix the muffin mix, applesauce, and egg together. Pour the mixed cake batter into the foil lined dutch oven. Place lid on dutch oven, cover with coals, and bake for 20-28 minutes depending on your heat. Use your nose to test doneness. How crazy easy and while camping! Your recipes are amazing! Thank you for sharing on Merry Monday! Hope to see ya next week! Wow having cake over the campfire is a great idea, this looks so good! Thanks so much for sharing with Full Plate Thursday, we sure enjoyed your post!